Maximum receiver-sensitivity, with outstanding speech quality. 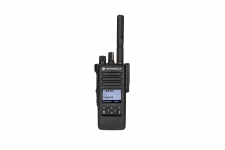 Both Motorola two-way radios belong to Motorola's MotoTRBO Series, setting the standard for top-quality digital speech transmission and technical perfection. 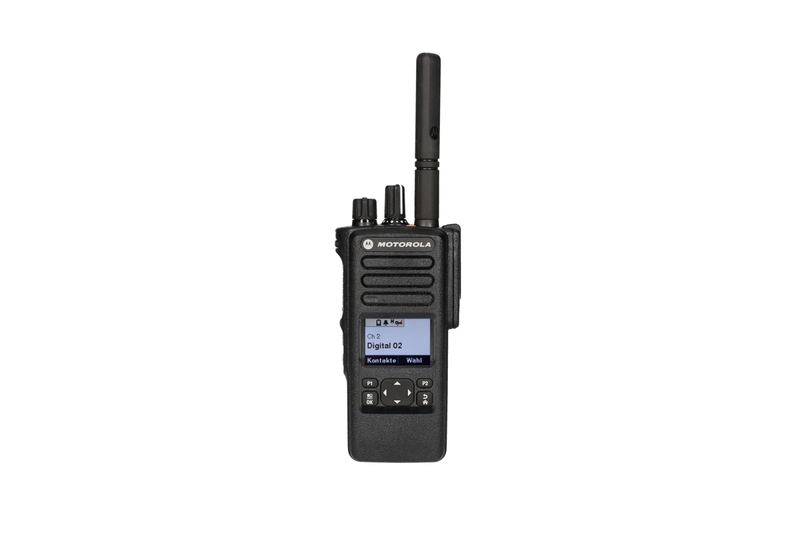 In contrast to the smart Motorola SL4000, the Motorola DP4600e (like its predecessor ) is a hybrid two-way radio that can be operated in both analogue and digital modes. The standard model we provide has 8 analogue and 8 digital channels. While the digital channels deliver the advantage of crystal-clear speech transmission (even in loud surroundings), analogue mode often makes it possible to achieve a somewhat greater range. However, the Motorola DP4600e's range has already surpasses that of its predecessor by 10%. The "e" in the model number "DP4600e" stands for "enhanced" – and that term applies to the DP4600e's range, too. The DP4600e has 10% greater receiver-sensitivity, providing a substantially wider coverage area. This improvement is especially noticeable in urban areas and in wooded environments. Motorola hasn't just endowed the DP4600e with a wider range. The device also features a highly intelligent battery-management system, allowing up to 27 hours of use with a battery of just 2.075 mAh. Bear in mind that actual performance can vary greatly, depending on how the two-way radio is utilised and what the desired range is. You can rent a replacement battery from us for €1 per day. It's always a good idea to have a replacement on hand, especially for longer productions and outdoor applications (cold weather, etc.). Within a suitable cell (e.g. when used with our MotoTRBO SLR5500 or Motorola DP3000 repeaters), the DP4600e offers up to 1,000 channels, including private calls, text messages and much more. Our standard DP4600e rentals come with 16 programmed channels. If you need additional parallel channels, just let us know when you request your quote. The DP4600, the predecessor of the Motorola DP4600e, was already a winner. It was awarded the title of "best audio quality in its class" repeatedly. With its significantly improved digital vocoder (AMBE+2™), the DP4600e goes another giant step further. A smart noise-reduction system has been added, making the DP4600e the gold standard even in the loudest environments. Options like Bluetooth, a colour display, WLAN capability (IP architecture), telemetric functions and a newly integrated man-down function round out the DP4600e's feature list. The DP4600e is the two-way radio of choice, especially for use in applications featuring repeater networks (SLR5000 / DR3000) and "one-to-many" communications. Seamless integration, simple, easy-to-use operation and sturdy housing make it the favourite two-way radio of logistics specialists and facilities managers. Large buildings, exhibition halls, radio communication in urban areas, steel-reinforced concrete...the high receiver-sensitivity in uniform environments (that is, in radio groups in which enhanced devices like the DP4400e, DP4600e or DP4800e are being used exclusively) enables radio communication even in difficult environments. The intelligent ambient-noise suppression system and innovative vocoder offer outstanding speech quality, even in loud surroundings like steel-processing facilities, Formula 1 events, festivals and loud concerts. So, you'd like to rent the Motorola DP4600e from us? We'll be happy to assist you! We'll gladly draw up a quote for you, quickly and with no commitment required, including our comprehensive range of accessories (headsets, two-way radio batteries and our Enterprise Service). We look forward to taking your call at +49 30 2938197-0 or receiving your email at mail@Radio-Rental.com.